Venerable fishery sets sights on future. 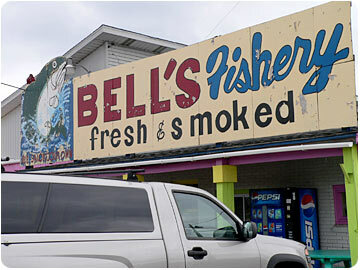 Bell’s Fishery has been a fixture in Mackinaw City for decades, providing fresh and smoked fish to retail and wholesale customers at the northern tip of Michigan’s Lower Peninsula. 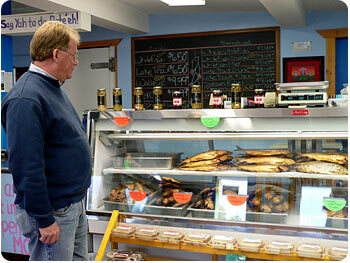 Now owned by Little Traverse Bay Band of Odawa Indians and under new management, Bell’s Fishery also offers sausage, pâté and other snack foods in its retail area. Bill Mogford, who has years of experience in the wholesale food business, is pleased to be managing this establishment now, with its long standing excellent reputation for product and service. A fried fish basket is the most recent addition to Bell’s lineup, and has proved popular with the thousands of tourists who flock to the area every Spring, Summer and Fall. 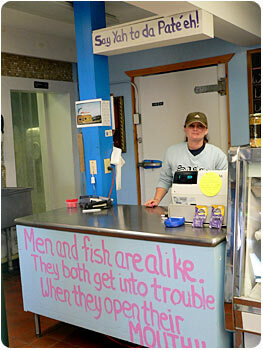 “People eat with their eyes,” he says, so he and his staff pay special attention to making the shop visually appealing with its variety of fish, cheeses and condiments, as well as the 1,2 and 3 Piece Whitefish Baskets. Mogford has no illusions about the challenges involved in a business that depends on the harvest of wild fish by fewer and fewer fishing operations. But he’s optimistic enough to expect that it won’t be long before fish products become a staple at Biindingen, the Little Traverse Bay Band’s convenience store in Petoskey. He thinks that the future of the business depends on increasing the number of customers, and he’s committed to doing what it takes to help them enjoy Great Lakes whitefish.